Everyone remembers the first time they beat Portal. A hilarious boss fight was followed by an even more hilarious credit sequence, in which the deposed AI villain GLaDOS serenaded/taunted you with a bit of passive-aggressive pop called “Still Alive.” While the game became an instant classic, the song became a hit in its own right. College students marched to class humming the melody. 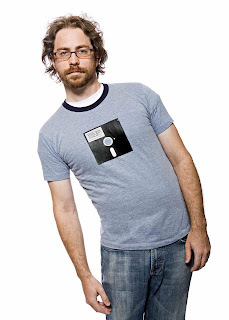 Its author, Jonathan Coulton, became an instant superstar. Some call it geek rock, but that doesn’t quite fit. Coulton’s songs have heart and substance. “I Crush Everything,” a song about a lonely giant squid, could have been all concept; instead, Coulton’s songwriting makes the listener sympathize with a sea monster. His ear for melody is nearly flawless – see “You Ruined Everything,” a song about happy accidents, or “First of May,” a spry bit of folk about, um, nature. And picnics. We’re huge fans of JoCo, and we recently asked him about his music, his live shows, and his thoughts on Creative Commons licensing and DRM. Hit the jump for his answers. Charge Shot!!! : We're a little over a year out from Portal's release - because “Still Alive” was such a memorable part of a singularly memorable game, it has been played a lot. Are you sick of it by now? Do you worry that you'll still be singing "This was a triumph!" well into your sixties, like some sort of geeky Paul McCartney? Jonathan Coulton: Like many of the “drawbacks” of being a rock star, this is a good problem to have. So far I’m not sick of anything I do – I try to mix up the set list, and some songs rotate in and out. But my live shows are not in huge arenas (yet) so I find that every show and every audience brings enough variation that it’s always interesting, even if I’m singing the same songs. CS: You made a splash with your cover of “Baby Got Back” and covered other songs, including Queen's “We Will Rock You.” What do you look for when choosing a song to cover? Any more in the pipeline? JC: It has to be a song that I have a lot of respect for as a Good Song. There has to be meat on those bones, whether it’s the lyrics or the structure, and ideally there’s some room to play with the style a little bit. I’ve never understood why people cover songs without really changing them, for me it’s about reducing it to the core of the song and then building it up again in my voice. CS: You contributed some neat harmonizing to MC Frontalot's "Diseases of Yore." Any other collaborations on the horizon? JC: I also did a similar thing for MC Lars on his track “O.G. Original Gamer” which is on his new CD “This Gigantic Robot Kills.” I’ve admired both those guys from afar for as long as I’ve been dreaming of becoming an internet rock star, so it was a pleasure to collaborate with them. CS: You've released all your music under Creative Commons, which for the uninitiated means that it can be freely shared and used without getting snagged in copyright restrictions. Clearly you are a guy with some opinions about Digital Rights Management, which is an issue affecting the entertainment industry at large. If The Man called tomorrow and put you in charge, how would you try to make consumers happy? How would you try to make corporations happy? JC: Lately my dislike of DRM has been getting more acute: any piece of digital content that has DRM, or is locked to a particular piece of hardware just feels broken to me now. We have a long way to go to make consumers happy – I’ve spent the last year or so trying to get a living room entertainment setup that has everything I want, and I can tell you that it doesn’t exist. There’s certainly no all-in-one solution, and when you cobble stuff together you run into all these ridiculous limitations. Why can’t I watch DVR’d shows on my other TV? Why can’t I just put all my kid’s movies on an ipod? Of course you can do these things if you really want to, but not without some effort and technical expertise, and generally not without breaking the law. And as for the corporations, it has never been the responsibility of consumers and artists to make corporations happy, and it shouldn’t be now. CS: You once called Thing A Week an "interesting cultural artifact," which seems almost quixotic in a profit-driven industry. First, are you even in that industry? And second, how do you balance the desire to create a cultural artifact with the need to make money? JC: I think I must be in the music industry, though I don’t know if the industry knows it or would care to admit it. Lately as things have gotten crazier for me I’ve begun to use some of the old-school methods, sort of experimenting to see if they still make sense. My new live DVD “BEST. CONCERT. EVER.” (yes, that’s a plug) has a good old fashioned distribution deal, so that I won’t have to lift boxes and keep a lot of packing tape around. Balancing art with money is always tricky, and it’s the reason there’s still a need for things like distribution deals. The beginning of my career has been thrilling and rewarding, but it doesn’t scale – I need someone else to pack the boxes so I can focus on making the music. CS: In these uncertain times, everyone's trending down their sales forecasts, but your music has always allowed customers to pay pretty much whatever they want. Have you noticed a downturn? JC: It always waxes and wanes, and it’s never easy to figure out why, especially since so much of my traffic comes from links and word of mouth. But I am doing better than General Motors. CS: You've said before that the album is dead, mostly because of popularity of single-song MP3 downloads and digital distribution. You have your DVD, called BEST. CONCERT. EVER. dropping in February – do you think that the video disc is also dying? What of the monolithic, stand-alone boxed game that people go out to a store and buy? Some people really like their physical media. JC: I can’t tell you how sick I am of disks – lately the absurdity of having these stacks of plastic all over the place has really begun to hit home. It’s only a matter of time before physical media are only there for commemorative purposes, the way vinyl has gone of late. I am also a person who likes his physical media, but it’s less and less convenient. CS: Holy crap, you have a cover band. Youtube fan videos is one thing, but now there's a group of people has assembling to pay tribute to your music. What's that like? JC: It’s all crazy. Projects like that make me feel like everyone out there must be thinking of some OTHER Jonathan Coulton. Of course it’s incredibly flattering to think that people would spend the time on something like that, and above all it’s really fun to hear and see what comes back at me. CS: People have asked if you would ever start playing with a full band, but you seem hesitant to go in that direction. Do you prefer the one-man operation for its streamlined creative process? Is there something in the connection between a solo artist and the audience? JC: I’d love to play with a full band and I hope to do it someday. At the moment I have very little overhead when I tour, which means I can make a profit from trips that are short enough to keep me and my family sane. Adding a band would greatly complicate things to be sure, but I really hope I can make it work eventually. The solo thing is fun too, but there’s nothing that compares with sharing a performance with a bunch of other musicians. CS: In your time as a codemonkey, did you ever experiment with programming or game design? JC: I never had the chops for it, though I often wished that I could put down the database and pick up the physics engine. I think that if I’d been born a decade later, I might have gotten a lot more involved in software much earlier on – personal computing didn’t exist when I was a kid, so I kind of fell off the back of that wave. CS: Being a full-time musician and father would sap anyone’s leisure hours, so we’ll expand the timeframe here: What’s your favorite game of the past five years? JC: I can give you a few pretty recent ones. Portal was terrific, and I say that not because I was involved with it, but because it’s simply an outstanding game. I liked Braid a lot, and am nearly finished with World of Goo, which I also find really fun and different. Strangely, a recent obsession of mine has been Zuma on the Xbox, which is one of those puzzle games that you can’t stop playing even though you’ve long since stopped enjoying yourself. CS: Having performed in Second Life and written a song for a title of critical acclaim, you seem to be in the middle of a gradual melding of music and video games. Is there a type of game you'd like to write music for? Or a song that needs a game around it? JC: I wish I know what that project was, because I’d love to work on it. Gaming as a medium is still so new, we’re just beginning to learn how to use it to tell stories and create characters. There’s plenty more to be done in that direction, and however it ends up taking shape, I think it’s going to be very different from what we’ve imagined so far. Look at Rock Band – who saw that coming? CS: You've said that your songs evolve as you tour - if I'm a stay-at-home Coulton fan, what curve balls can I expect from BEST. CONCERT. EVER.? JC: The slow and sad ones really benefit from the solo acoustic guitar treatment, that’s how I write everything so it’s usually where the songs have the most room to work. And of course having my friends and fellow musicians Paul and Storm up there singing with me adds a lot too, kind of a CSNY for nerds. The thing I love most about a live show that you can’t get from studio recordings is the interaction with the audience – a group of several hundred people makes a lot of noise and tells a lot of jokes, and through some strange hive-mind alchemy actually turns out to be a pretty funny improvisor. CS: There's no precedent for what you've done – that is, to the best of our knowledge, none of the Internet troubadours have gotten as far as you. There's no example to follow. Where to from here? JC: Indeed. Let me know when you figure that one out. Jonathan Coulton's concert DVD, BEST. CONCERT. EVER., will be released with an accompanying CD on February 10, 2009.